Move your squad of Marines up the beach of Tarawa island as fast as you can to secure the objective! After several days of bombardment from nearby U.S. naval battleships, the 2nd Division of the United States Marine Corps made their way to the small island of Tarawa. The objective was simple: take the island, but Tarawa was heavily fortified by the Japanese forces that occupied it with 500 pillboxes and many machine gun nests. The Top Brass knew the assault was risky and dangerous. They were right. During the 76 hours of combat, nearly 6,000 Japanese and Americans died. Leathernecks ’43, a self-published game by game designer Chevee Dodd, is comprised of 2 game sheets, 24 Player markers (4 black, 4 blue, 4 green, 4 purple, 4 white, and 4 yellow), 20 Smoke Grenade chips, and 7 custom six-sided dice (2 white, 2 black, 2 green and 1 blue). The game sheets are made of thick cardstock, the Player markers out of wood, and the dice and chips made of plastic. Illustration wise, Leathernecks ’43 is just slightly above what I would consider “functional”. No flash here, but everything fits together very well. 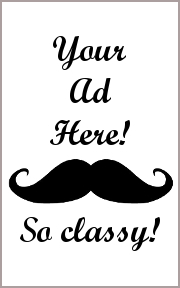 Note: Prior to playing the first game, the owner will need to apply stickers to the 7 six-sided dice. This won’t take long, but do budget you time accordingly. To set up the game, first take the 2 game sheets and put them together, side-by-side. The end result will be a rectangular playing area. Second, each player should select a set of 4 Player markers of the same color and place one Player mark on each of the “0” positions located on the game sheets. Third, each player collects 1 Smoke Grenade chip, setting the rest in a pile within easy reach of all the players. That’s it for game set up! Determine who should go first and begin! The game is played in turns with each player taking all 7 dice and rolling them. Every player’s objective is to advance their Player markers along two different tracks. These two tracks are the Soldier track and the Advancement track. In the context of the game’s theme, the Soldier track represents the soldiers in the player’s squad (Officers, Sergeants, and Radio Operators) and the Advancement track represents an individual player’s overall level of combat effectiveness. When it is the player’s turn with the dice, they complete 3 steps. These steps are summarized here. The player takes all 7 dice and rolls them. The results of the dice are separated into groups: Officers, Sergeants, Radio Operators, Advancements, Smoke Grenades, and Suppressing Fire. Everything is represented with easy to identify icons. If the player has rolled a Smoke Grenade, they can place the Smoke Grenade die into the Suppressing Fire space instead of 1 Suppressing Fire die and any one Officer, Sergeant, or Radio Operator. If the player has a Smoke Grenade chip, they can place it in the pile to cancel 1 Suppressing Fire die – there is no limit to the number of Smoke Grenade chips that can be spent on a player’s turn. If the player did not roll or does not have any Officers, Sergeants, or Radio Operators available, the Suppressing Fire is ignored. If the player has a total of 3 or more Suppressing Fire die in the Suppressing Fire space, their turn is over and the player immediately scores their remaining die, if possible. Note that Advancement die rolls can never be countered by a Suppressing Fire die roll, and are therefore safe. If the player has a total of 2 or less Suppressing Fire dice currently in the Suppressing Fire space, they have two options. If the player chooses to keep going and rolls the dice again, they do not have to re-roll all the dice. The player can select from any dice available to them except those that are currently pinned down in the Suppressing Fire space. In this way, the player can elect to keep a grouping of Officers, for example, and re-roll their other dice in an attempt to roll more Officers. When scoring the roll, the player will first select one soldier type: Officers, Sergeants or Radio Officers. 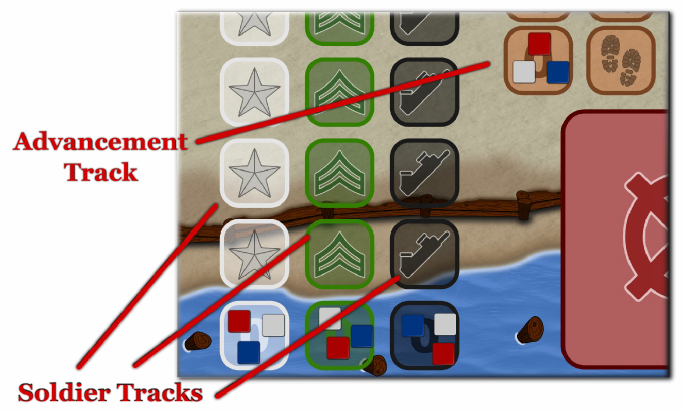 Based on the number of icons rolled for the selected soldier type, the Player marker is moved that number of spaces on the matching column located on the Soldier track. For example, if the player rolled 3 Officers, they would move their Player marker forward on the Officer track 3 spaces. The player is never requires to select the largest grouping of soldier types, and if the player doesn’t have any soldiers, this part of the scoring is simply skipped. The player will then move their Player marker forward on the Advancement track 1 space for every Advancement icon they rolled during their turn. The player can also get bonus Advancement points each time one of their Player markers lands on or passes a “+5” space on the Soldier track (for a total of 15 bonus points). Lastly, if the player rolled any Smoke Grenades that were not used to counter Suppressing Fire, they receive 1 Smoke Grenade chip. The dice are then passed to the next player in turn order sequence unless the endgame condition has been triggered. The game continues until a Player Marker is moved onto the “Victory” space located at the end of the Soldier track. To move a Player marker onto the “Victory” space does not require a player to roll the exact number needed. Thematically speaking, the player has just taken the fortified pillbox and the rest of the soldiers can now advance forward safely. The player should finish their turn and score their rolls as normal. After endgame scoring is determined, the winner of the game is the player who has the most Advancement points. We introduced several house rules to address some player concerns and to adjust game difficulty. These are not part of the “official rules” of the game, but you are welcome to use them if you like. Extra Grenades: For younger players and non-gamers, consider giving two Smoke Grenade chips to them instead of one at the start of the game. Covering Fire: When the player lands on the “Victory” space during their turn, instead of triggering the endgame, all the players who have not yet gone get to have their turn. The endgame scoring is then completed after all the players have had the same number of turns. Ammo Cache: Instead of collecting the +5 bonus Advancement points given on the Soldier track, the players get 3 Smoke Grenade chips. Heavy Resistance: Instead of allowing the players to roll as often as they care to based on the number of dice they have available, each player only gets 3 tries. After their third roll, the player immediately ends their turn and goes to scoring. This is a good house rule when playing with 4 or more players to keep game length and speed of play at a brisk pace. Split Victory: The game’s rules state that players who are sharing the same most forward position on the Soldier track both get 10 points. This house rule splits the 10 points as even as possible (rounding down) between the number of players who share the same space. For example, if 3 Player markers occupy the same forward position during endgame scoring, each player would get 3 Advancement points instead of 10. This makes the position of Player markers during the game much more strategic and tactical. 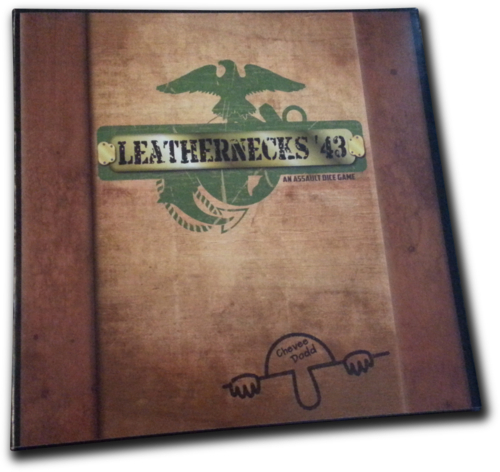 To learn more about Leathernecks ’43 and read the full rules, visit the game designer’s web site or the Game Crafter. I think Leathernecks ’43 will do very well at the family gaming table. Based on the rules, the game appears to be very straight forward with simple decision making that will require logical thinking to win the game. For the Child Geeks, Leathernecks ’43 should be well within reach having already demonstrated superb geek skills while playing games like Zombie Dice, Martian Dice, Trophy Buck, and Farkle. All of those games share similar game mechanisms, but Leathernecks ’43 is unique in it is scoring tracks. Still, I don’t anticipate any issues, but I am curious to see if the Child Geeks grasp the importance of managing their individual Player markers on the Soldier track. For the Parent and Gamer Geeks, I think Leathernecks ’43 will enthuse, but at different levels. 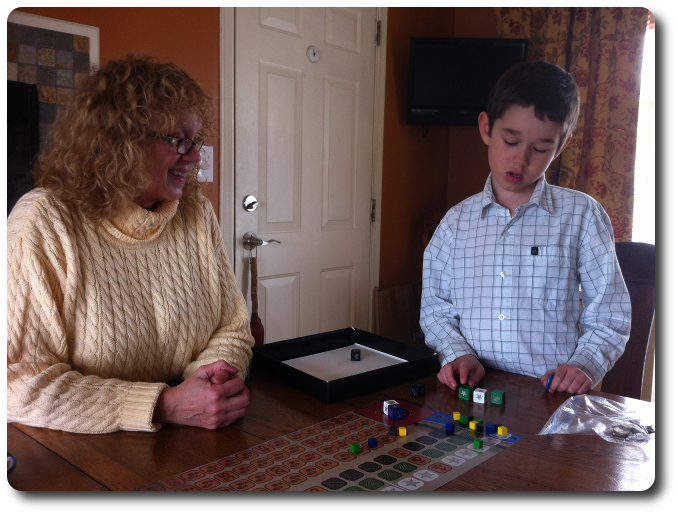 The Parent Geeks, I predict, will enjoy the game at the family gaming table, both with their family and their peers. The Gamer Geeks, if they like Leathernecks ’43 at all, will at most view it as a casual and light filler. Which it is. Teaching the game is very simple. In fact, if you have to teach the game, I suggest you do so by going through a player’s turn and then demonstrate the endgame scoring. It is very important to make sure that all players realize that victory goes to the player with the most points on the Advancement track, but victory is only possible if you can manage to stay ahead of your opponents on the Soldier track. When we taught the game using this method, none of our players had any questions or felt confused. And so, after explaining the game to my two oldest little geeks, I asked them their thoughts on Leathernecks ’43 so far. Of course I will, but I don’t think my 5-year-old will have any issues. He might not win, but he should understand the game well enough to play it on his own. Let’s play Leathernecks ’43 and see if the game was well worth our geeky assault or we end up casualties of another bad game. All the Child Geeks we played the game with did a great job, but only the 8-year-olds and above grasped the importance of managing the Player markers on the Soldier track. The younger players focused on getting large number of matches, which worked for and against them. A player can gain points every round through Advancements, but if they don’t actively attempt to move all their Player markers on the Soldier track, they will quickly fall behind. The older Child Geeks understood this and did very well. The younger Child Geeks did not, which resulted in them never winning. Not that they cared. In fact, none of the Child Geeks cared if they won or lost. They all enjoyed Leathernecks ’43 and gladly gave the game their endorsement of approval. Parent Geeks thought the game was a good one for the family and the more “geeky” Parent Geeks enjoyed playing it with their peers. Leathernecks ’43 is a game you can play with lots of noise and activity in the background, making it perfect for those Parent Geeks who get together for dinner parties or weekend lunches with friends. While the little geeks wrestle on the floor and run around the house, the Parent Geeks can keep one eye and both ears on the Child Geek chaos and still play with one eye fixed on the gaming table. The Parent Geeks thought the game was surprisingly deceptive when it comes to its simplicity All it would appear was needed to play was to roll dice, make large groupings of dice, and score points. That’s only half the story. Players are also racing, albeit in an abstract way, and must attempt to keep ahead of their opponents on the Soldier track. As the race continues, the risks get more and more high as the “Victory” space gets closer and closer to be landed on! The Parent Geeks really liked this and gladly approved Leathernecks ’43 for family and Parent Geek casual play. The Gamer Geeks didn’t think much of Leathernecks ’43 at first. “Oh, look…another dice game,” said one Gamer Geek. After playing a few turns, they started to see that the game required a great deal of logical thinking to stay competitive when playing with their peers. While the Gamer Geeks grew to enjoy the game, it was a bit slow going. They enjoyed it enough to create several house rules that they thought made the game “even better”. Not once did the Gamer Geeks think that Leathernecks ’43 was anything but a casual dice game, at best. They did like how fast it played and how many players it could handle, making it a good one for starting a session of gaming, ending an evening, or simply waiting for fellow Gamer Geeks to arrive. When the game was boxed and put away, all the Gamer Geeks thought Leathernecks ’43 was “pretty much OK”. The Gamer Geeks gave the game their endorsement of approval for being a good casual and fun game filler. Leathernecks ’43 has had a very interesting journey. You wouldn’t know it by playing and looking at the game that it started out as a project that involved princesses and rainbows. Leathernecks ’43 was initially designed as a game to be played with the game designer’s young little geek daughters. I had an opportunity to do some early playtesting of the game (then named Princess Dice) and I greatly enjoyed the level of thought required by the players to be competitive. Eventually, the game fell off my radar and I forgot all about it. Many months later, I received an email from Mr. Dodd saying he had a game for me to try that was based off of Princess Dice. “Based off of,” I asked? When I was told it was a game set during World War II, I was understandably confused. The last time I saw the game, I was collecting unicorns and dresses. Now it was a game with the U.S. Marines assaulting an island? It sounded like Mr. Dodd was playing a trick on me, but sure enough, Leathernecks ’43 is Princess Dice. Although, the final game is much more structured, has better rules, and feels much more complete than its predecessor. From a magical land full of princesses to a small pacific island full of death, this game has come a very long and strange way. Simply fascinating when you think about it. I wonder if Doom started out as a game to teach preschool children the importance of cooperation. 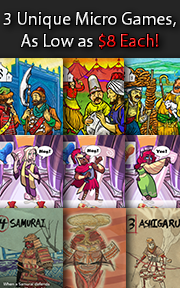 The number of house rules we created should only suggest that the game’s system is very flexible and easy to add to. Not that it is a bad game. This is a very good, casual, and easy to play. Easy to play, but not easy to win. Everyone pretty much makes points every turn and the game always gets that much closer to ending. Players can’t be sloppy if they want to be competitive. And, yes, I realize that the dice insert a very random element into the game, but only the results are random. The player gets to decide and take action on them, which puts a lot of control in the player’s hands. But like the chaos of war, the dice will always keep you guessing and playing the odds. That’s enough to keep just about anyone engaged, especially when what a player must focus on changes as the game progresses. The game can get a little long at times, especially when playing with 6 players. During one turn, a player rolled no less than 12 times in a row. He never rolled anything that was negative, but never kept what he rolled. My 8-year-old can be like that sometimes – very stubborn. I think he gets it from his mother, but I know better than to say such things… out loud…with her in the room…. But even with the occasional downtime between turns, the house rules (which we think make the game even better), and the sometimes maddening randomness of the dice, Leathernecks ’43 remains a very entertaining casual dice game full of risk management, logical thinking, and swearing at little cubes. I found it to be much fun and would happily recommend it to Child, Parent, and Gamer Geeks. Do give this game a try. Tagged Child Geek Approved, Dice Games, Father Geek Approved, Gamer Geek Approved, Parent Geek Approved, World War II. Bookmark the permalink.